I have stayed in a variety of places in Paris, everything from friends’ floors to hostels, from hotels that were expensive and horrible to hotels that were cheap and horrible and a few that were nice. With that in mind, we put a fair bit of effort into our choice of accommodation for this trip. 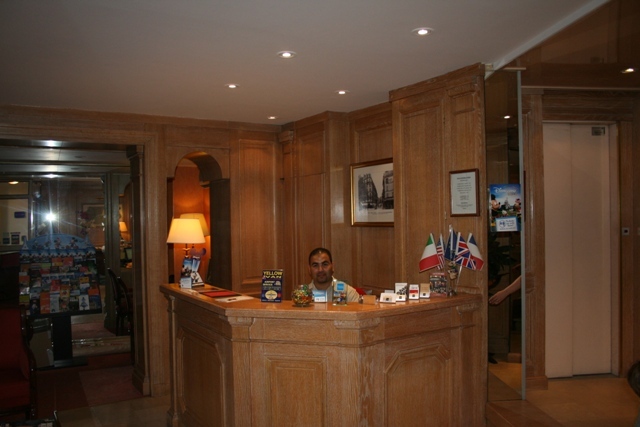 The main concern was cost – Paris hotels normally cost an arm and a leg, we found the Eiffel Kennedy which was reasonable, took a chance and booked it. I was pleasantly surprised. The location was first class – a residential neighbourhood, really quiet at night with loads of nice restaurants close by. It was also within walking distance of the Trocadero and the Eiffel Tower. I loved the hotel’s friendly vibe, it felt like a home away from home. There were only 30 rooms so it was intimate and charming. The neighbourhood felt super safe. We were often out and about late in the evenings and always felt comfortable. We dined out in some fantastic local restaurants and found a great bakers just across the road from the hotel. There were also a couple of supermarkets a short walk away, useful for stocking up on drinks and snacks. The receptionist at check-in was so helpful, tips and hints were thrown at us. The staff were all excellent and went out of their way to help. We arrived at 11 am and were able to go straight to the room with our luggage. The room was teeny tiny though – pretty typical of Parisian hotels in my experience – but the size does take your breath away. We got used to it and settled in nicely. There was a double bed and a camp bed pushed right next to it for Son. We had to put our cases on the bed to be able to close the door. It was fairly basic but spotlessly clean and had air-conditioning and a little mini-bar. The bathroom had a bath – always a plus for me – and the wardrobe (due to space constraints) was in the bathroom! A bit of an unusual set-up but at least the steam sorted all the clothes creases – packing and folding are not my strengths! We had a view of the Eiffel Tower from our room – granted you had to lean out of the window and look over the rooftops, but it could be seen! 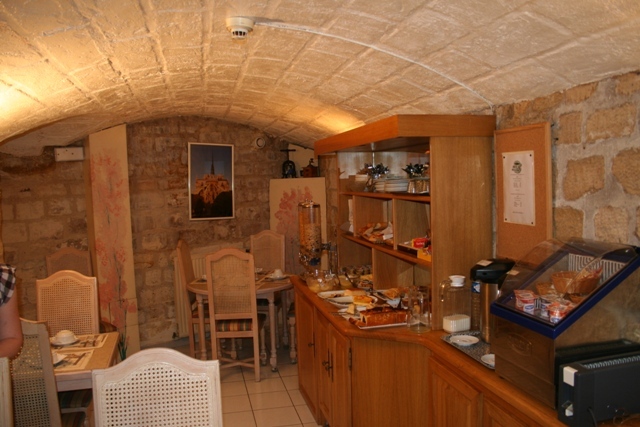 Breakfast was served in a basement room which reminded me of an old wine cellar. Cozy indeed and I loved it. They had a superb selection of breads, cakes, cereals and eggs which set us up for the day ahead. There were a couple of metro stops a short walk from the hotel, but best of all we discovered a walkway to the Eiffel Tower. Swan Island is a pedestrianised area on a dyke in the middle of the Seine. 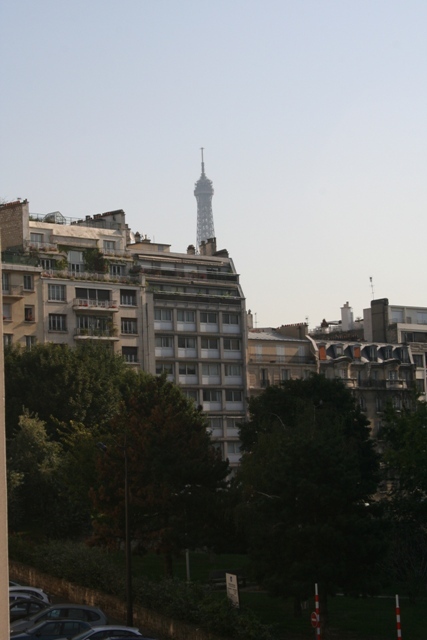 It goes from close to the hotel right to the Eiffel Tower and takes about 15 minutes. It was so peaceful, traffic-free (a rare thing in this city) and lovely views all the way. This was a perfect place for us in Paris, we loved it here and would definitely go back. 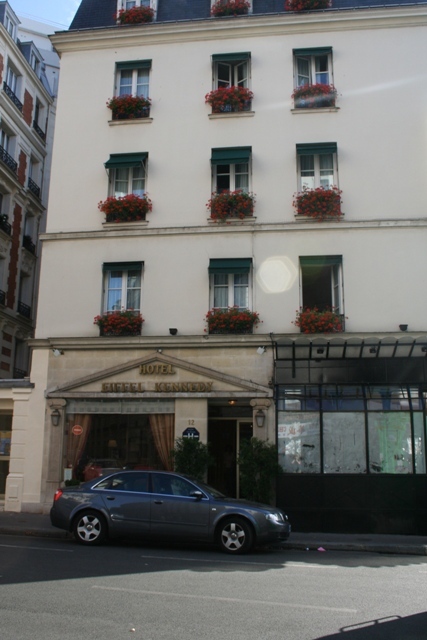 The room was super small, but the location, homely feel and great staff made it a perfect Parisian base. Depence how you look: We see US rooms and cars, too big 🙂 That’s diferent perception. But yes, it’s perfect. I agree, biggest is definitely not always best. In this case tiny was just right for us! According to needs, US is huge, it’s normal to be all big. Here is everything small. In Japan even smaller. You know those little tiny rooms with just bed, like chamber. Lol my English, sorry if you didn’t understend something. Thanks for the tip! We are always looking for affordable/nice places to stay. Not the most luxurious hotel ever, but it was reasonably priced, clean and fab location, I would stay there again. Ironically, the most spacious hotel room I’ve ever got in Paris was when I was travelling solo, and booked a single room. The hotel didn’t have any other room left but a triple room, so there I was, staying on my own, with 3 beds in the room. Wow, that was a good stroke of luck though – getting to choose the most comfy bed out of 3! Thanks for this post. I am always looking for a new place to stay in Paris. I have stayed in many places from hotels, to hostels, to foyers, to friend’s places…… this looks like a winner. I am adding this place to my address book now! We loved it – suited us perfectly! The location is great and the price is too! Ooh, I love the wine cellar breakfast basement! I know – every hotel should have one! I was going to say absolutely, then I wondered if they’d lose their rarity value. Eh, another breakfast in a wine cellar, etc. Maybe it should be kept special? There must be other awesome things hotels can serve breakfast in. Like… giant… coconuts…? Well, look, I’m not in the hotel business. Great suggestion for a hotel – it looks charming and what a good location! The location was fantastic – being able to walk to the Eiffel Tower was so great! It was charming too… definitely recommend it. Hi Joy – many thanks for this hotel tip, will report back if/when we go there! And cheers, for dropping by to see my blog pics of Paris. Thanks Owen, hope you like the hotel as much as we did! Loved your pictures too. We loved it there, small but lovely, I would stay there again if we visited Paris.